After Hillside moved to Concord Street, Whitted became a junior high school. You are right - my apologies. I've corrected the error. So when are YOU going to build something? Every building in Durham, from Duke Chapel to those obsolete 1920s house all over East Durham you're so enraptured with, were built by people who put down either their own money or their own word of honor on a contract to get them built. You come along 80 years later and think your aesthetic sense should command taxpayers money to preserve what you like. Hillside High will probably be preserved, thanks to the 50 year-old black people in Durham who remember when it wasn't a gang-plagued holding center for thugs. What exactly have you built in Durham? Well-deserved, Gary Kueber. Well deserved. When Gary Kueber gave up practicing medicine several years ago, he stopped worrying about tending to people's fevers, aches and pains. Instead, he took on a new patient: a city whose signature bricks and mortar he hopes to save from the so-called progress that often leads to sameness. "The homogeneity of a lot of the new places we build disturbs me," says Kueber, now a preservationist. "The plasticized, franchised lack of uniqueness that defines a lot of American life -- I find that disturbing." With that philosophy, Kueber, 38, has emerged as one of Durham's most resolute advocates for conserving and restoring the architecture of years gone by. For two and a half years, the New Orleans native has pieced together a provocative snapshot of this former tobacco town at his Endangered Durham blog, endangereddurham.blogspot.com. "He's creating a very valuable resource," says Lynn Richardson, head of the Durham County Library's North Carolina Collection. "He does such a good job of gathering information and making sure it's correct. It's a tremendous resource, a gift for Durham." Preservation is not only Kueber's preoccupation, it has become part of his occupation at Scientific Properties, a company behind several significant redevelopment projects in Durham's old tobacco district and the Hayti neighborhood, once the center of a thriving black middle class. Kueber did not set out to be a preservationist, nor did he plan on making a living in urban planning and development. He invested most of his 20s and a lot of money in becoming a doctor. After working in private practice for four years, diagnosing lots of sore throats and constantly wondering why he was less than enthusiastic about his work, Kueber started shopping around for a new profession. "Medicine never seemed fun to me," Kueber says. "... It was sort of like being entranced or in love with the idea of doing something, and not being entranced with doing it on Monday morning." In 2004, with bachelor's degrees in English and zoology from Duke University and a medical degree from Louisiana State University, Kueber returned to the classroom. After receiving a master's degree in public health in 2005 from UNC-Chapel Hill and doing a residency in preventive medicine in 2006, Kueber got a master's degree in urban planning in 2007. During those studies, the disillusioned physician was drawn more and more to research that showed the impact of urban planning on the well-being of a city's people. By that time, Kueber had adopted Durham as his home. He bought a former mill house, and while renovating it became curious about his property and the broader history of the area around him. Soon, Kueber was digging through photo archives in the Durham County Library's North Carolina Collection. He pored over Durham history books and land records. As Kueber explored the Bull City's rich past, he worried more and more about its future. Significant landmarks were being demolished. The Royal Ice Cream parlor, the site of Durham's first civil-rights sit-in, was torn down. "I got a call from a friend of mine who said, 'You won't believe what they're doing,' " Kueber recalled. "I ran out there with my camera. But I was too late. It was a pile of rubble." Properties were being neglected, and city ordinances and state law offered few protections. The county and city were getting rid of whole blocks to make room for governmental development. So Kueber set out to educate people. He posted old photos from the library archives and the Durham Herald-Sun's collection from the past 50 years. With evocative narratives and images from today, he shows what Durham is in danger of losing as it marches ahead in time. Perusing his blog is like taking a virtual tour through a city lost to the wrecking ball, and looking into the faces of generations lost to time. There are blurbs about old high schools, fire stations, downtown buildings, parks, and houses where important movers, shakers, musicians and physicians in the city once lived. "Part of what I wanted to do was an inventory -- an inventory that would include what was gone," Kueber says. "It's definitely a labor of love. I do post something new every day." Sitting in a coffee shop in downtown Durham, Kueber looks out on a new courtyard off Corcoran Street where a beloved bull statue stands today. On that site three decades ago was the Washington Duke Hotel -- a high-rise building with a grand lobby and noted guests. "Martin Luther King spoke in that building," Kueber says. Over the summer, Kueber posted about the tobacco auctions, auctioneers and seasonal culture that played such an important role in the city. Much of what he posts is written on the weekends and saved for daily distribution later in the week. These days, his focus has been on East Durham. "I'm glad his blog is there," says Eugene Brown, a city councilman. "Although I don't always agree with him on all his issues, he contributes to Durham in a positive way." Kueber cannot really pinpoint what drives his interest in preserving old buildings. Part of it stems from his New Orleans roots, he says, and part could be because his mother studied architecture and cared about preservation when he was a child. Not only does he find the architecture of the past more interesting and aesthetically pleasing than much of what goes up today, but Kueber says he finds it environmentally wasteful to demolish existing structures that could be refurbished. Durham has made strides, he says, with reinvestment in the downtown. "The biggest thing I would love to see is people all over the place," Kueber says. "There would be lit-up storefronts, and people coming in and out and just walking the streets. It would be a very walkable city without spaces that feel desolate. I just love going to places, not to do anything, but to immerse myself in the hustle and bustle." FAMILY: Single. He is the son of Gary Kueber, retired head of the New Orleans public school computer systems, and Dotty Kueber. BOOKS ON THE NIGHTSTAND: "The World Without Us" by Alan Weisman, "Cradle to Cradle: Remaking the Way We Make Things" by William McDonough and Michael Braungart, "Another Roadside Attraction" by Tom Robbins, "The Amazing Adventures of Kavalier & Klay" by Michael Chabon, "Report to Greco" by Nikos Kazantzakis. Durham history books are splayed on the floor in the study. MUSIC IN THE iPOD: Modern rock, alternative rock, jazz, blues. "No country," he says. And what a huge school it is! A wonderful gymnasium going to waste now (pigeons everywhere). The floors in the very large auditorium are softening from roof leaks. But the building also has a basement area that once housed a nice shop class and woodworking area- there's still old boards and such down there. Got a nice band room too. Instead of building a school to replace WG Pearson they should have given a look at renovating this one. Yet another great post! It would be nice if Durham would save it; hopefully Mayor Billy/UDI or NCSU won't get their mitts on it! And, another kudo from the N&O! With that write up, and the recent Indy and Durham Magazine articles, it's good to see you're getting some well-deserved recognition. Congratulations. I am new to the blogosphere but not new to reading your posts. I just wanted to say that you do Great (capital g) work and please keep it up! I am all for the preservation of the Whitted School. There is much that can be done in an edifice that once signified progress for the community. Interesting post. Have you ever been inside the school? Unfortunately, I haven't. I'm sure it is a wreck inside by now- time to start renovating before it gets any worse. Kinda interesting that out of all the old and decrepit buildings that you have profiled, This school apparently hasn't been touched. It's just sitting there. What do you make of this? Looks like the county plans to try to at least stabilize the building ... not by demolishing it. Bravo! Do you know of anybody that has pics of inside the school when it was in use? Hi, I am a student who is interested in doing a documentary about the rich history of this school and the possible future renovations. Does anyone have an recommendations on sources I should begin searching through. Also, do you know who I can contact to secure permission to enter the school? I'm trying to make some contacts, but so far they have gone unanswered. Any help would be great! DURHAM -- Local officials have been holding talks on what to do with the historic Whitted School building. For several weeks, county, city and school officials have been discussing the possible restoration of the 1922 structure, one of the earliest schools for black students in Durham. "I really want to see Whitted School revitalized, renovated -- something done to make it usable for the community," said Michael Page, the chairman of the County Commissioners. "And I think that right now, the discussion has begun, and we are headed in a positive direction." "It can inspire a lot of other things when, if someone's willing to take that first step and breathe life into an area," Mike Ruffin, the county manager, said of the potential for renovating the Whitted School. "Lots of things can happen because of it." The Durham Board of County Commissioners, which owns the property, could receive a proposal for stabilizing the decaying former school in a matter of weeks. The roof is leaking, which has the potential to cause severe structural damage, and the building has long been a target for vandals, who have smashed windows and ripped open internal walls. The building's obvious abuse and neglect mirrors that of many nearby residences, some of which are vacant. In one sense, little progress has been made on the task of rehabilitating the Whitted School. Last year, when commissioners were briefed on the matter, the board seemed dismayed by the cost of protecting Whitted from further damage. It also resisted a proposal to demolish the school's postwar addition. Now, however, County Commissioner Ellen Reckhow seems amenable to demolition, which could save money in the long run. And by involving leaders of the city government and school system in their deliberations, the county could be building support for renovation. The city has long been working to redevelop the neighborhoods of Southside, where the school stands, and Rolling Hills, which is nearby. Eric Becoats, Durham Public Schools superintendent, has expressed an interest in expanding the availability of local pre-kindergarten programs, which is one use under consideration for the school. There has also been talk of converting the school to housing for senior citizens and of placing nonprofit agencies in the building. The ultimate use, officials noted, will depend on whichever organization steps forward to pay to rehabilitate the old school. "Everything right now is just at the beginnings in terms of scoping out possible reuse and perhaps a possible partnership with a private entity," Reckhow said. Some Durham leaders believe the Holton school experience will influence the rehabilitation of Whitted. After years of disuse, the renamed Holton Career and Resource Center reopened in mid-2009 as a specialized public high school, city recreation center and Duke medical clinic. Some credit it with helping to revitalize North-East Central Durham. "In the context of it being a multiuse partnership, that answer would be yes," City Manager Tom Bonfield said when asked if Holton might serve as a template for Whitted. "In terms of being a replication of what's currently at the Holton Center, I would say probably not at all." I was raised on that side of town for 40 years and my mother was a student there! I have a excellent idea for this building.Who do i contact in reference to this building? The documentary, "Upbuilding Whitted," which first aired this summer at the Center for Documentary Studies, will be shown again at the St. Joseph's Hayti Film Festival on Feb. 16, 2013. The documentary, which was produced by Bruce dePyssler, April Simon, Purity Kimaiyo and Chi Brown, examines the history and significance of the Whitted building to Durham's African Americans, first as Hillside Park High School, built in 1922, and then as Whitted Junior High. Correction, Hillside graduated its first twelth grade class in 1924. My great grandmother was a member of that class. Additonal information - Whitted School was named for James A. Whitted who was the first African American principal in Durham. His brother London, was the first African-American principal in Orange County and his sister Louisa A. Whitted Burton was a teacher in Durham. Burton School in Durham was named for Louisa at the request of W.G. Pearson one of her former students. The Whitted's were also related to James Shepherd, founder of NCCU through his mother Harriet Whitted. 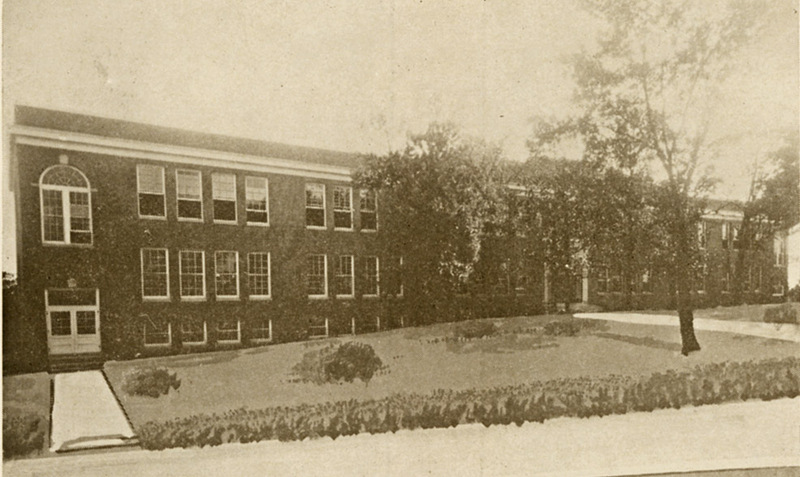 Hillside Park High School, 1922. The original Hillside Park High School was built in 1922 on the northern edge of land donated by John Sprunt Hill for Hillside Park. Hillside Park High School was the first high school for African-Americans in Durham; prior to 1922, the Whitted, East End, and West End Graded Schools were the only educational facilities for African Americans - these schools only taught up to 8th grade. Even then, Hillside did not have a 12th grade until 1937, and the 12th grade offered solely vocational training until the 1940s. Below, Hillside Park High School, 1949. Around 1950, the need to expand the high school, and the lack of land to expand into at this site, prompted the School Board to switch Whitted Elementary School and Hillside Park High School (which became simply Hillside) with one another. This building then became Whitted Junior High School. It remained Whitted into the 1970s, at which point it was abandoned. The building housed Operation Breakthrough in the late 1970s and early 1980s, and has housed several other programs since that time. It has been completely abandoned for several years now. I believe that as the first high school for African-Americans in Durham, it is essential that this building be preserved, particularly given the loss of so many other original school buildings. You are right - my apologies. And what a huge school it is!